Four guards. Four guards standing in front of large white blast doors. The blast doors served as one of many entrances to the large white complex that these guards would give their lives to defend; a Lightor base. They stood in the way of Dylan’s mission, Dylan’s rescue, Dylan’s revenge. Each one wore gleaming white armor, though they did not have helmets on. To Dylan they were four guards, four targets… four dead men who needed to be informed of their lifeless state. Dylan longed to bathe the walls in their blood. I’d love to give these white walls a nice yellow paint job, Dylan thought to himself, but that was not a part of Vu’s plan. Vu’s plan required the utmost secrecy. That they infiltrate the base not as enemies, but as fellow Lightor. This is what they had decided on the flight to the base, and now that Dylan saw the three guards waiting at the entrance for them, he realized that perhaps this may not be the best time to be dressed in all black. Still though, Dylan couldn’t help but sneak a quick glance at himself in the mirror every now and then. He would have to wear this outfit around Shorya after this mission, if they both left this base alive that is. At least his sword was properly hidden. Strapped onto his back in an old invention made by Barre, the “shadow sheath.” Barre had thrown it together a few years ago. Essentially, it was a sheath that was embedded with a cloaking device so that it could render itself, and the weapon sheathed inside of it invisible. Its function was to allow Dylan to carry his katana around in public without attracting attention. 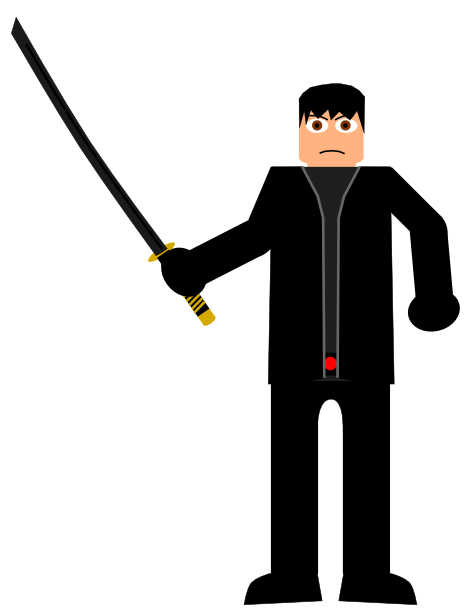 If he was attacked, he had his katana on him to defend himself with, and if he was apprehended by the Shadikill authorities for carrying a concealed weapon on him, well… what could they really do? He was the Shadkill prince after all. He never thought he’d be using it to infiltrate a fortified Lightor base. “You said there would be one guard!” Dylan angrily whispered to Vu. The young Lightor stood beside him wearing a white jacket and pants, and a blue shirt. “So I did,” he calmly responded. Vu had specifically chosen to land at this landing platform because it was not very heavily guarded. “You told me this was the least guarded platform at the base!” Dylan continued. “Yeah well, I’d rather not have to ‘adapt’ to an entire base of Lightor soldiers trying to kill me!” Dylan said with a wry grin as they reached the guards. “Why hello there!” Vu said as the first guard stepped forwards to greet him. “That would be great,” Vu replied with a smile. Dylan felt his heart skip a beat. “Is that really necessary?” Dylan asked, barely keeping his voice from shaking. “Is there a problem here?” the second guard asked as he stepped towards Dylan with the device. “No sir, no problem at all,” Vu replied with a chuckle. “My friend here is just afraid of needles. “Oh don’t worry,” Dylan said as he lifted his arm to pull his sleeve back, yet found his hand slipping closer and closer to the invisible katana on his back. Dylan knew that in just two seconds, he could reach back, pull the blade out of its sheath, and run this petty guard through the gut with it. “I’m used to being around sharp things. In fact…” Dylan began before stopping short. In a little over a second, he was staring at his own black blade, stabbed through the chest of the guard. “I have something a lot sharper than a needle on me,” Dylan said, before twisting the blade. Almost immediately, the first guard raised his blaster and swiftly took aim at Dylan, but just as he was firing, Vu kicked him in the hand with his left leg, causing his shot to miss, and forcing him to drop his blaster. The guard barely had time to register what had happened before Vu unsheathed his broadsword (similarly hidden in a shadow sheath) and stabbed it straight through that guard’s heart. Before the guard behind him could draw his blaster, Vu slammed his right foot into the guard impaled on his broadsword, sending his body flying into that of his fellow guardsmen. As the fourth guard took aim at Dylan, Dylan pulled his katana free from the second guard’s body, and maneuvered himself behind the guard’s body. As the fourth guard fired at Dylan, the shots struck Dylan’s ‘corpse shield’ repeatedly, but never fully penetrated the back plating of his armor and struck Dylan. Not wishing to prolong this contest any longer, Dylan sheathed his katana, and drew his magnum. Acting on instinct, he stuck the muzzle of his magnum through the hole in the first guard’s back and fired, angling the barrel towards the fourth guard’s head. All it took was three clean shots, right between the eyes, before the guard toppled over dead. As the third guard regained his balance, Vu leaped forwards and kicked him in the gut, bringing him to his knees. In a flash, Vu had the flat edge of his blade on the Lightor guard’s left shoulder. The guard looked up at Vu for a second before Vu swept his blade to the left, cutting straight through the man’s neck and sending his head tumbling to the ground. “Are they aware of our mission?” Dylan asked. “That’s very comforting,” Dylan said with a wry smile as he opened the blast doors with a button on the guard’s control panel. “Where too Vu?” Dylan asked, the obvious intent of a rhyme clear in his voice. “I thought we were trying to be stealthy,” Dylan observed. Two Zabraks stood in a dueling ring, staring at each other, gauging each other, waiting to strike. One was a pale brown Zabrak in a combat suit, and the other was a red skinned Zabrak encased in black armor. In the brown skinned Zabrak’s left hand was a double bladed lightsaber, one of his blades green and the other blue. In the red skinned Zabrak’s right hand, she held a crimson bladed lightsaber. The young male Zabrak lifted his right hand to wipe the beads of sweat off of his face. This was not the beginning of the duel, it was merely a brief pause, not meant to last more than a few seconds. The duel itself had been going on for hours. The young Zabrak was drenched in sweat, but when he glanced over at his older opponent, her skin did not even have one bead of sweat clinging to it. The young Zabrak twirled his double bladed lightsaber in a quick flourish before holding it in an opening stance that had one blade angled forward and the other pointed back. The older Zabrak brought her blade up vertically directly in front of her face. The beginning of a Makashi salute the young Zabrak realized. Now was his chance to strike. As the Zabrak charged at his opponent with the first strike in a sequence of disconnected jabs and crosscuts, he hoped to catch her mid-salute, but the older woman swiftly brought her blade to her side, and ever so casually twirled her blade behind her back until it was held above her head and angled behind her. As the first of his strikes came in, his opponent brought her blade down hard against his, knocking his blade back. In the past, such a forceful maneuver would’ve knocked him off-balance and quickly ended the duel, but not this time. This time, he twirled his weapon with the momentum and brought the other blade around in a form V strike, pushing his opponent’s blade to the side. Immediately afterwards, he followed up with an aggressive flurry transitioning between Ataru and Juyo attacks. His opponent took a few steps back under his relentless assault, but her blade was always up to parry his strike with more than enough time to spare. Never once did a shadow of doubt or even effort cross her face. Drawing on his anger, the young Zabrak fought harder, hammering away at his opponent’s defenses with his blend of Ataru and Juyo strikes, even working in a Djem So maneuver occasionally. His opponent however casually parried his attacks with liquid precision and great force, forcing him to adjust himself to the momentum of his weapon after each and every strike. She was fighting with a strange blend of Djem So and Makashi, combining dominating brute force with perfect form and precision. His attack was a raging storm, but her technique was art made manifest in blade work. It was time to change up the game. With a quick twist of his weapon, the young Zabrak transformed his saberstaff into two separate single bladed lightsabers. Without pausing he resumed his offensive, striking with an aggressive series of crosscuts from both blades. His opponent casually twirled her blade in an arc, forming a defensive wall with her blade, easily repelling each and every one of his strikes with a perfect mastery of Soresu. He did not let up. He wielded Jar’kai in various different strategies. Sometimes he would attack with both blades from opposing angles to catch his opponent off balance, sometimes he would attack with one blade while he would defend with the other, and sometimes he would attack with both blades from the same direction. But no matter what he tried, his opponent casually blocked every strike he made without faltering. Now twirling both blades around lightning fast, the young Zabrak rained a series of vicious blows and thrusts down upon his older opponent, drawing even deeper on his anger and giving himself over to the thrill and bloodlust of Juyo. This time, his opponent responded with a carefully calculated blend of Soresu and Shii-Cho. Swinging her blade in long swipes that caught both of his blades before bringing her blade closer to her body to more efficiently respond to his counter attack. He was now being driven back. His opponent’s mastery of Shii-Cho allowed her to easily counterattack against several angles of attack at once, and her mastery of Soresu allowed her to block his own attempts at a counterattack. While his opponent was expending a little more effort now, the young Zabrak was fully aware of the fact that she could end this contest at any second she chose. He knew he was going to lose this fight from the very beginning, nothing he did could change that. But if he was going to lose, then he was going to at least put up some semblance of a fight and show his opponent what he could do. In a flash, the Zabrak leaped backwards, and before his opponent closed the distance, he leaped into the air towards her, and twirled his body around in an Ataru maneuver, swinging blades from his right side in her direction. The blade in his left hand was held forward and the blade in his right was held back. His intention was to strike her blade with his left before following up with a strike from his right, but things did not go according to plan. His opponent easily evaded his first strike, and struck his back blade with great force, throwing his entire maneuver off balance. Rolling with the momentum, the young Zabrak twirled around and landed on his feet bringing both blades held back and to his sides. Honing in on his opponent’s bloodshine blade, he swung both blades in an arc straight towards the blade. He felt his arms reverberate as both of his blades struck that of his opponent at the same time with great force, initiating a blade lock. Their yellow eyes met as they pressed against each other’s blades. He put every bit of strength and anger he had into his arms, trying to drive his opponent’s blade aside with his own, but it was no use. With one hand, his opponent pressed hard and forced both of his blades to the side. He attempted to regain his composure and bring both blades down in front of him in vertical slashes, but his opponent was faster. Before he knew it, her blade flicked towards him in a wide arc, sweeping both of his blades to the side. Before he could get his blades back up, she twirled back around and lashed at him again with another Form I Sarlaac Sweep, this one angled down towards his gut. Much to his displeasure, the young Zabrak was force to let his body drop to the ground as the tip of his opponent’s blade passed a centimeter above his face. Frantically, he rolled to the side and scrambled back to his feet, knowing his opponent could’ve killed him then and there a dozen times over if she wanted. Back on his feet, the young Zabrak recombined the two hilts of his weapons, reforming his saberstaff. As he and his opponent drew closer to each other, he began to twirl it around at his side like a buzzsaw. His opponent flew at him into an aggressive frenzy of Juyo strikes, a wild flurry of lethal and furious slashes and jabs. The young Zabrak brought his weapon in front of him, using it like a shield to repel every strike that came his way. Going on the offense, the young Zabrak brought went on the offense, angling the edge of his twirling saberstaff towards his opponent, carving intricate patterns through the air as he attempted to batter through her defenses. His opponent quickly transitioned into a blend of Soresu and Makashi, effortlessly deflecting and redirecting every one of the offensive flurries that came her way. This offensive went on for several seconds until finally, he twirled his saberstaff above his head, and his opponent stopped its motion by catching the blue blade of his saberstaff with her red one, and initiated a blade lock. With his blue blade locked against her red one, he gave the hilt of his saberstaff a quick twist, freeing his green blade. Taking his green bladed lightsaber in his left hand, he swung it at his opponent’s side while her blade was still pressed against his blue one. Before his strike could connect however, his opponent pressed her blade into his hard, and swung her own blade in an arc, sweeping his blue blade down towards his green one, and catching both blades against her own before pressing him back. With both of his blades pressed together, his opponent swung upwards, splitting his two blades apart, before swinging her blade in several forceful arcs, bouncing her blade off of his own blades in a circular pattern, driving them further and further away from each other with each strike. When his blades were practically at his sides, she thrust her blade forwards, slashing him across his right cheek before slamming him in the face with her pommel. The young Zabrak collapsed to the floor, and when he looked up, he found the blade of Darth Slazer, the greatest blademaster in the Sith order with her blade pointed at his throat. “Thank you my master,” Darth Vicrant said with a tone of astonishment in his voice. “Tell me their name so I can end them!” Vicrant said eagerly. “I will not fail you… mother,” Darth Vicrant said as he strode off towards the exit to the Temple of Dueling, ready to seize his destiny. Dylan and Vu were sprinting down a hallway in the Lightor base as fast as their legs could carry them. They had just accessed the data terminal, and now they had to reach the control center before those inside realized there was something wrong. It was a thirty second window at best, and they had finished up at the data terminal twelve seconds ago. “How many guards are we expecting?” Dylan asked as the entrance to the control center got closer and closer. “Two if we are lucky, ten if we are not,” Vu responded as he pulled two blaster pistols out of his white jacket. “So fifteen then,” Dylan replied with a smirk as he drew his own weapons. When they reached the blast doors that served as the entrance to the control center, Dylan and Vu leaned against the walls on either side of the doors. Dylan jabbed his slicer spike into the control panel next to the side of the door. Almost immediately, the blast doors slid open, and Dylan and Vu rushed inside. The room was filled with several control panels and display screens, with a droid operator sitting at each one. There were two guards stationed at each of the four entrances to the control room, and seven guards standing idle at various positions in the room. Exactly fifteen guards. “Told ya!” Dylan jeered as he plunged the tip of his blade through the faceplate of one of the guards standing at the entrance they just came through. Vu rolled his eyes as he brought his hands together and shot the other one in the head at point blank with both blasters at the same time, continuing to shoot him as his body collapsed to the ground. At this point, the other thirteen guards whipped out their blasters and opened fire on them. Dylan grinned as he and Vu took off in opposite directions, each heading for one end of the room. As Dylan approached one guard, he shot him twice in the chest with his magnum before lopping his head off with a swipe from his katana. Wrapping both arms around the headless body, Dylan flung it at the nearest Lightor guard, sending him toppling over. Dylan raced forwards, dodging several blasterbolts as he put a few of his own between the eyes of the Lightor soldier who stood next to the toppled over one at one of the other entrances. When Dylan reached the toppled soldier, he shot him in the face three times before he could stand back up. On the other end of the room, Vu leaped up on a control panel and caught an unfortunate Lightor guard in a crossfire, mowing him down before leaping over him, and landing behind another Lightor guard who stood in front of his respective entrance. Before the guard could turn around, Vu tossed both of his blasters into the air, grabbed the man’s neck, wrenched it to the side, and let his lifeless body fall to the floor, all before casually lifting his hands to catch the twin blasters. Both Dylan and Vu turned their attention to the two guards on the far end of the room trying to open the last entrance to the base. But it was sealed by Vu’s efforts at the control panel. Before those two guards realized what was happening, Dylan had shot one of them, then impaled them on his katana after closing the distance. Vu himself peppered the other guard with a dozen well placed blasterbolts to the chest. Six guards remained scattered around the room. Without a moment’s hesitation, Dylan jumped onto a control panel, and leaped towards the nearest guard. He was positioned in an angle at which the other five guards could not fire upon him without risk of shooting their fellow guard. When Dylan was but a couple of feet away from the guard, he thrust his leg out and kicked the guard square in the chest, sending him stumbling backwards. Dylan dropped out of the air, stabbed his blade through the guard’s gut, then ducked behind a control panel to use it as cover. Glancing down at the dead guard, Dylan noticed he had a shotgun. Grinning to himself, Dylan sheathed his katana and holstered his magnum before taking hold of the shotgun in both hands. He trusted his instincts to tell him when the right moment was. Suddenly, he knew what to do. It was time to strike. When he leaped out from behind the control panel, one of the lightor guards was standing three feet away from him. “Bang,” Dylan said as he pulled the trigger, splattering the guard’s brains all over the wall. A second guard fired at him, but Dylan rolled out of the way before bringing up the shotgun and catching him square in the chest with a large burst of blasterfire. Before the man could get back up, Dylan shot him in the chest twice more, ending his life. When he glanced over, he saw that Vu had felled two other guards. One with a barrage of blasterbolts, and the other he dismembered with his broadsword which he now held in his hand while his blasters were holstered. Wait a minute! Dylan thought to himself, That’s only fourteen! He turned and looked to see one last guard. Instead of fighting, that guard was running towards the set of blast doors they came in through. The only available escape to the room. Dylan could not let him get away. Before Dylan could draw his blaster however, Vu hurled his broadsword across the room, stabbing the guard through the back and bursting out the front of his chest. “Show off!” Dylan said as he walked over to the chief operator. A Lightor cowering beneath his control panel. “Fair enough,” Dylan said as he grabbed the chief operator by the collar and flung him over the table. Walking over to him, Dylan stared the man in the eye. In this Lightor’s eye, he saw fear, he saw confusion, but most of all, he saw the same thing in the eye of every Lightor he came across (with the exception of Vu); contempt. “No loose ends,” Dylan said as he drew his katana. After a brief moment of hesitation, he swung his dark blade through the air, and in less than a second, the chief operator’s head was on the ground. Satisfied that the secrecy of their presence in the base was at least somewhat secured, Dylan glanced over at Vu, who was busy slicing into each of the droids’ programming with a program designed to make them serve him. When Vu was finished, he walked over to a control panel and started accessing the computer mainframe. “I found it!” Vu said. “Well that complicates things,” Dylan responded. “We need a change in plan,” Vu said. “To accommodate for this heightened security. With that, Dylan turned around and walked out of the control center. He was going to find Shorya. He would tear this whole place apart looking for her if he had to. He would do this because he loved her.